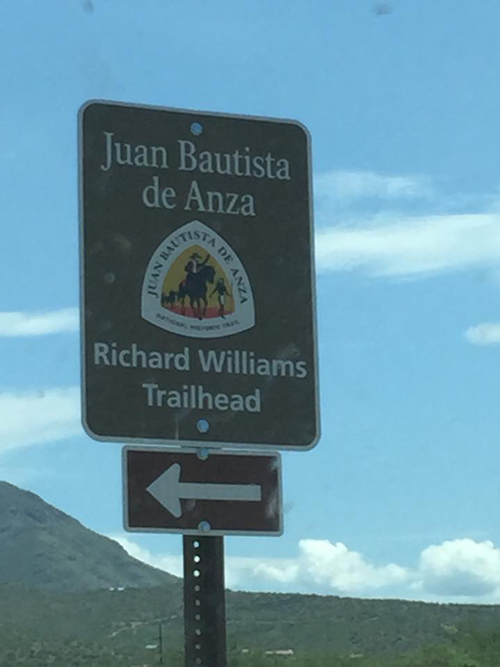 The new trailhead sign at Palo Parado in honor of Richard Williams. 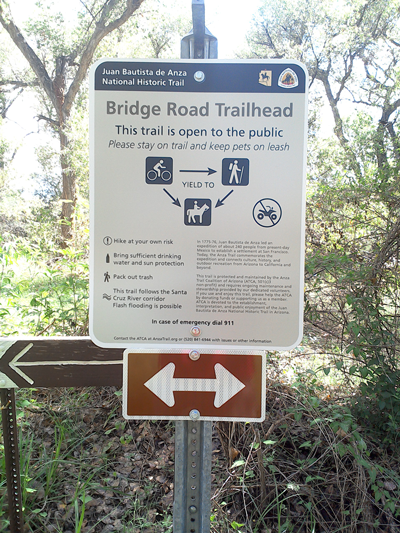 After many months of planning and design the ATCA now has wayfinding signs installed in Santa Cruz County. Many thanks to the National Park Service and the Public Works team at Santa Cruz County. Please support Americorps (NCCC). The NCCC team has visited Santa Cruz County for the past 3 years taking on projects like the Anza Trail, Rio Rico High School, Nogales Boys & Girls Club and much more. Please make a donation to help us cover their housing costs - See attached Flyer. Join the Tuscon Presidio Trust for a presentation from the Lecture Series. "Remington called them Buffalo Soldiers". The 2015 Tubac Festival of the Arts opens Wednesday 2/4 and runs through Sunday 2/8. 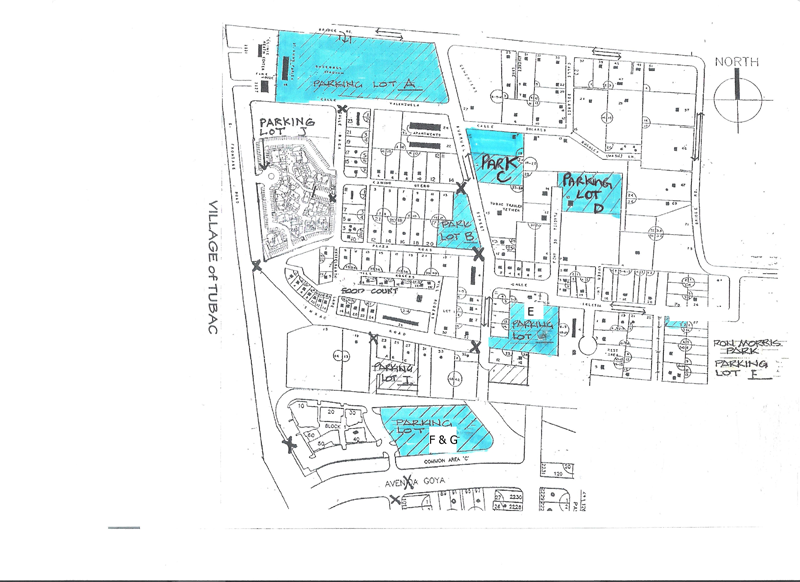 Please ask to park in LOT C, map attached. 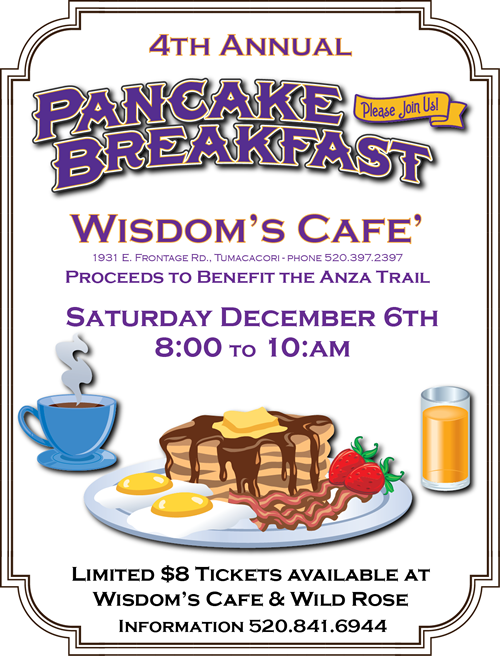 Join the ATCA at Wisdoms Cafe for our 4th Annual Pancake Breakfast. This year the event will be Saturday December 6th, 8-10am. Tickets are $8 and available in advance at; Wisdoms Cafe, Wisdoms iDOS! & The Wild Rose. From Jerry after todays trail party; Trail is now open and signed from Tubac to the Mission. It is still rough through the Aliso Springs wash and the bridge within the Mission is not installed. However, there is no problem crossing the wash or the river for any able bodied person. Stream is narrow so a short jump is all that is required. From Jerry; All participants trimmed the trail from Bridge Rd. to Clark Crossing except for Franz, Dennis & I who drove to the Mission and trimmed from the trailhead to the River. Those sections are very good for hiking now except for the wash just North of Clark Crossing. Hikers can get thru, but must be careful of loose rocks and deep holes in the wash.
From Jerry; The wash north of Clark Crossing and South of Santiago is badly washed out where our trail goes down the hill on the North side of the wash.
Festival of the Arts parking roster. Good News! The trail team installed a new bridge yesterday at Old Bailey Crossing, 1 mile south of Clark Crossing. This is a temporary trail & crossing until the ATCA has an opportunity to work with the landowner to establish a new easement and river crossing location. Thank you to Jerry & Glenn. A sincere thank you to all volunteers who signed up for Tubac Festival of the Arts parking. We have a full team in place and we are ready - let the fun & games begin! 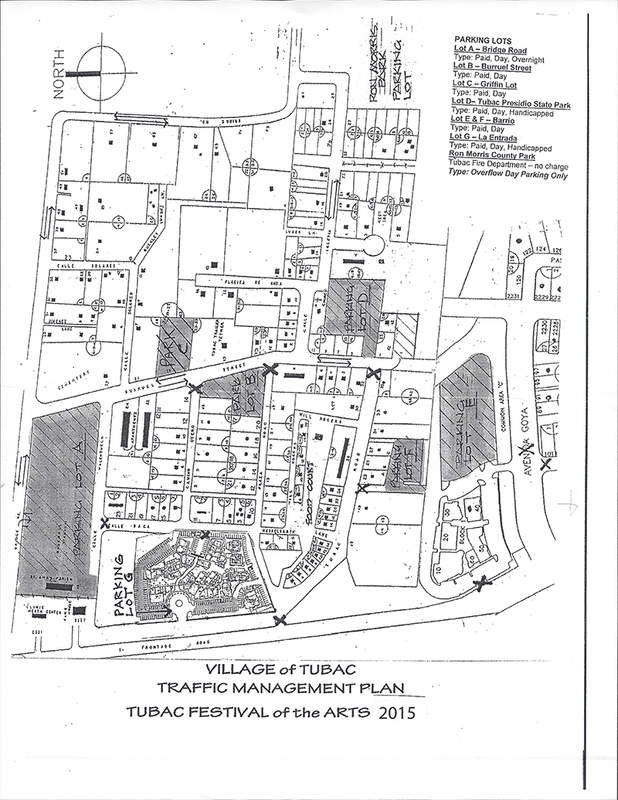 Once again the Tubac Chamber of Commerce invited the Coalition to participate in parking for the Tubac Festival of the Arts. We will be parking cars at three (3) lots this year. The Tubac Secret Garden Inn, the Griffin lot on Burruel and a new lot on Calle Ingesia - all proceeds to the Anza Trail Coalition. Last year we proved the Tubac Festival of the Arts is our #1 fundraiser so we are hoping for great things again this year. We need volunteers for ~3 hour shifts. If you would like more than one slot we are happy to oblige. For those of you who have not volunteered at an event before this is a great opportunity to enjoy the festival and experience the event and its people while helping the Anza Trail. Contact info@anzatrail.org or call (520)841-6944 to offer your support. The Trail at Clark Crossing was re-routed to avoid most of the muddy sections and signed 1/19/13 identifying the temporary route. The river is flowing to the south at Bailey Crossing. It will be a wet crossing until we install a bridge. The trail map has been updated with the existing route, see our "Visit the Trail" section under the The Trail tab. If you have a truck that can pull an open trailer to help us move materials to the bridge site, please contact Jerry Behn at 520-223-3724. Please join Al Watson (NPS) for a hike from the Tumacacori National Historical Park on the Anza Trail Friday January 25th. This hike will repeat the last Friday of every month until further notice. Take a look at our Birding page for archives of weekly sightings along the trail in Santa Cruz County. Thank you, JimK, for sharing your data with us! 2pm - Friends of the Santa Cruz River honors the Anza Trail Coalition as their Volunteer of the Year! Join us at the Tubac Community Center for a brief business meeting followed by a presentation by Jim Lockwood about the birds of the SC River. Refreshments will be provided. 5pm to 7pm - ALL Anza Trail Coalition Volunteers are invited to the Celebration Feast in honor of Tubac Presidio Parks very special volunteer Barbara Ruppman...featuring a mesquite roasted turkey! Community Stewardship Celebration! - 10am - 1pm at the Guy Tobin Memorial Anza Trailhead - music, activities, guided walks, food and lots of fun. Tubac Health Fair - over 80 vendors on hand to discuss and demonstrate their specialties. 8am to 12pm - Friends of the Santa Cruz River and Watershed Management Group are planting native trees, shrubs and perennials around the new basins that were formed last Saturday...help us improve this native wildlife habitat. Planting workshop at the Guy Tobin Memorial Anza Trailhead - Friends of the Santa Cruz River and Watershed Management Group are planting native trees, shrubs and perennials around the ramadas to beautify and shade the area and to provide native wildlife habitat and food. 53rd Annual Tubac Festival of the Arts - ACTA Parking Fundraiser -Tremendously successful...we parked over 1000 cars in our 2 lots! 9am ATCA Parking Volunteers join us for an appreciation brunch at the Tubac Market ... You know who you are! Santa Gertudis trail segment clean-up - trail blocked due to fallen trees and limbs. Meet at 9am at the Day Ranch Trailhead - Exit 29 off south I19 to East Frontage Road, left to Santa Gertudis Lane, less than 1/4 mile on the right. Work boots, jeans, gloves, hat, loppers, chain saws suggested. Friends of the Santa Cruz River clean up a large site in Rio Rico, read the press release.